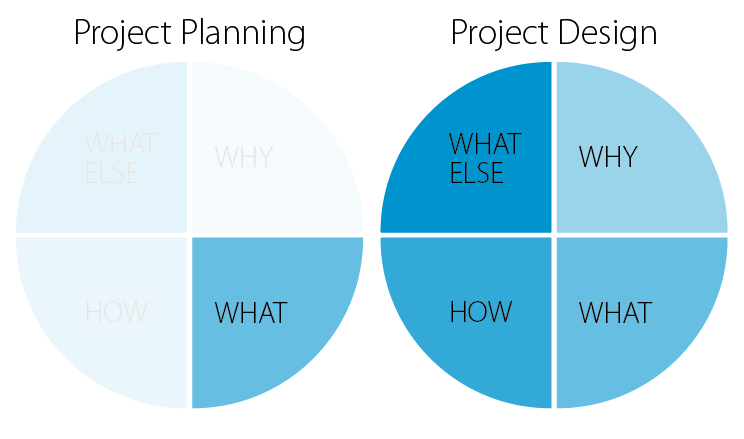 Most Project Planning programs only focus on doing things. I know from personal experience that this doesn’t always work. There is always a moment in every project where the honeymoon period ends and the tough stuff begins. Sometimes you can apply willpower and discipline to keep going and sometimes you just can’t. So it’s perhaps no surprise that most projects fail because of a lack of motivation. That’s why we’ve created Project Passion. It’s Project Design that includes your emotions, your inspiration and your passion in the design of your project. This is the framework you will use to design your project to create your best possible chance of success. The really good news is that thanks to our beta testers in our first Project Passion program we’ve streamlined things so you will get more done with less effort. We won’t be creating big plans anymore. Instead, I’m redesigning everything from the ground up using the principles of Scrum and Agile – the secret weapon of successful software developers around the world. The goal is to create a finished something at least every week. And, simply learning how to run a project the agile way will be a huge head start you can keep using way beyond this program! More important than what you will learn, is what you will create. Take a moment to think about your most important business challenge is right now… How would you feel when you’ve have had a breakthrough in that area of your business by the middle of the year? That’s the real prize. $4500 plus GST – ten sessions over 90 days and you can set the meeting times that suit you best. We can offer a payment plan if this helps you manage your cash flow. Email Geoff to discuss this. If you’d like to change the way you get things done in your organisation, talk to us about an in-house program. We’ve been working with a regional council to help implement a series of projects with their teams. $900 plus GST – Includes ten 2 hour sessions over 12 weeks and all course material. That’s only $50 per contact hour. To put the price of this program into context, think about what you want to create for yourself… Aim for 10 times value. For instance, if you paid $3000 plus GST for the Individual Program and you created a project around ‘Getting new clients’, could you generate $30,000 worth of new sales during this time or shortly after? Likewise, for the group program, can you add $6000 worth of value to your business? The other side of the equation is to look at the cost of not acting now. For instance, if you’re running your business all on your own and know you need to outsource some tasks, the cost to your health, potential for client mistakes or even family breakdowns could easily be the 10x value you need to make joining the program more than worthwhile. And, remember the key advantage to the Project Passion Program is that you’ll have support to keep you accountable, lift your flagging spirits and coaching for when you get stuck. Well thought out, supportive and challenging. I haven’t had the level of accountability Geoff provides … ever! The biggest mistake I’ve made way too often in my business is to consistently try to do things all by myself. Sometimes I get away with it, often I don’t. We all need support, particularly when we run into hurdles we didn’t expect. And, that’s almost certain if you’re taking on something new. Join our program to gain the support you need when you need it. Its been created to have you win through following a proven pathway. It’s with an experienced coach to keep you accountable and see things clearly when you get stuck. And, it’s with business people just like you pursuing similar goals. They can cheer you on and they may even be able to help you access the resources you need. The whole program will be delivered online so you can attend without leaving home, at the office or even if you are travelling. The weekly sessions will be delivered via webinar technology. All of these will be recorded in case you miss one. Plus, it will be supported with a private Facebook Group so you can ask as many questions as you like, share your wins and learn from your fellow participants. And, we’ll post your Course Manual and support materials online so you can access them at any time. It’s given me a flying start to the year. I have done a number of similar programs – none of which come close to what Geoff has put together. The Project Passion program runs for 12 weeks. That’s 84 days or a quarter of the year. You really can achieve a lot in that time. So think big… What would be a great result for you and your business in that time frame? The program includes ten live sessions that each run for up to two hours – we give you a little break in between a couple of sessions to free up some time for you to finish your project. Naturally we’d love it if you could attend every session and we know this may not be possible because you’ll be busy winning your game. We simply ask that you be in action and be in touch through the private Facebook Group. Plus you can catch up with the recordings. Friday mornings – Melbourne time – 8:30am to 10:30am – Ten sessions over 12 weeks. Here are the the dates for Project Passion 7 starting on April 6th and finishing on June 22nd. The most important thing we need from you is to create and undertake a Business Project you are committed to fulfilling. We want you to be in action, to be inspired and to play as if your business depends on it! Also, you need to be willing and able to participate in the online group coaching sessions. All live sessions will be recorded to ensure you don’t miss anything. Project Passion was THE reason I maintained momentum with my focus for 2017. It gave me clarity, kept me accountable and included all the hallmarks of current excellent adult learning principles. My vote of confidence is that I am joining the next Project Passion program too. During the program we will ask you to submit your Project Design. This will keep you focused and allow me to keep you honest around what you said and what you did. I’ll also be running my own project and sharing the obstacles and victories I experience along the way – so you can keep me honest too! During our live sessions we will discuss how you are travelling… Are you on track, off-track or have you lost track? And, if necessary we can then have a coaching conversation with you to put you back on your path to success. This means you need to be coachable. This means being open to a conversation about how your project is going and what is holding you back. Sometimes this can be difficult when a challenging obstacle confronts you. We will provide the care, respect and trust that is central to this conversation. The ten sessions of Project Passion look like this. And, we may vary it a little depending upon what the group needs next. I got exactly what I came for – a supportive and insightful kick up the bum! – and so much more. Please give my phone number to anyone who’d like to talk with a happy and satisfied client about the value of your program. It would give me pleasure to know I’ve helped someone work with you and bring one of their passionate programs to life! Check In – Is your project on track? Coaching – What does the group/individuals need right now? Each session is scheduled to run for two interactive hours. During the first 90 minutes, Geoff will share the key distinctions of the program (see the 10 points in the outline above). Participants can complete the exercises in their Course Manuals and type their questions and answers into the webinar question box. And, during the final 30 minutes, we open the line for live questions and personal coaching. Who is Project Passion For? Project Passion helped me to ‘unpack’ my thinking and challenged me to approach my project with a clearer understanding of what I need to do to set myself up for success. This is a business program. This means you’ll be creating and winning a business-based project – what this looks like is up to you. This also means the time commitment you will need to fulfill your project will vary. You could be just starting your business or have years of experience. You could be running your own business or part of an organisation. Whilst we will be talking about business strategy and we will offer some suggestions, we won’t be telling you how to run your business. Mostly, we’ll be focusing on what you need to win your project – this may include some personal coaching and even a personal breakthrough. And, so you know… I’ll be running my own project at the same time as you. This puts me in the arena with you so I’ll know what you’re going through and how it feels. Plus, I’ll be sharing my wins, my losses and my struggles. And, if things get really desperate, you might have to coach me! LOL! The program is based on what we’ve learnt from Book Rapper and some of the best business books by some of the best business thinkers on the planet. We’ll include the 12 specific Book Rapper issues as a bonus to deepen your learning from the program. Valued at $47. If you’d like to change the way you get things done in your organisation, talk to us about an in-house program. We’re currently working with a regional council to help implement a series of projects with their teams. $900 plus GST – Includes ten 2 hour sessions over 12 weeks. That’s only $50 per contact hour. Remember, it’s not the ideas you start with, it’s the things you finish that matters.